Media Future Week: an intensive week of co-creation, keynote speakers, businesses and experiences. 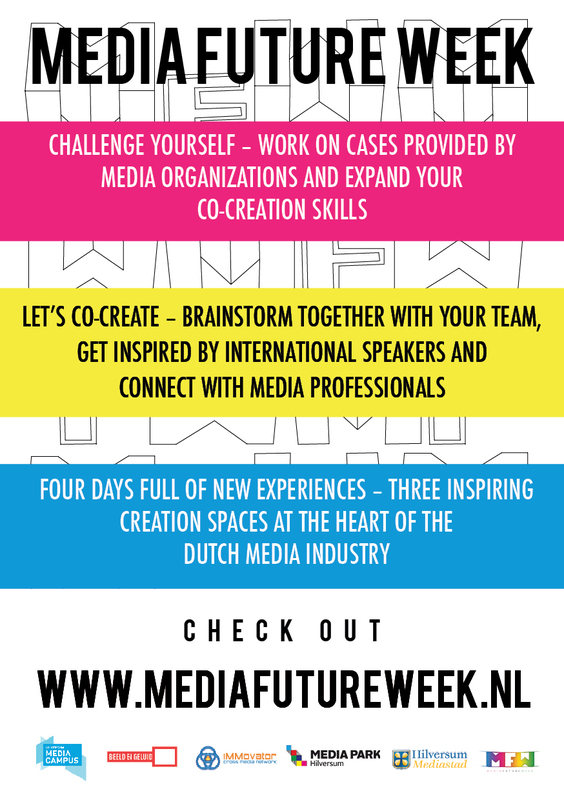 On May 15th, 2017, students and young professionals from the areas of multimedia, design, ICT, art, media technology and business administration will come together for Media Future Week in Hilversum. Also you can participate in this event. Over four days you will work on projects and topics provided by Dutch media businesses such as ‘Institute for Sound and Vision’ (Beeld en Geluid), NOS, Ericsson, TNO and ‘de Publieke Omroep’. More than ten Universities of Applied Sciences participate. Fill out the ‘keep me posted’ form below to see if you can become part of your Universities’ delegation. The program runs from monday 15th of may 9.30 to thursday 18th of may 18.00. On monday, tuesday and wednesday the program runs from 9.00 to 21.00. During the event food and hotel stay is fully taken care of. You will be working in teams consisting of students from other disciplines and Universities of Applied Sciences. Despite your different backgrounds, you have one thing in common: you are all motivated to find the best possible solution for the case assigned to your team! Each team will have a facilitator assigned to them to guide them through the work process. Through brainstorming and co-creation sessions, you will come up with a scenario for the case you have been assigned. International media experts will be brought to the Netherlands to inspire you, and businesses situated at the Media Park will be there to share their knowledge. By the end of the week, you and your team will present your solution to the case given to you, and you will leave with a wealth of newly acquired knowledge, experiences and contacts. Media Future Week is a great opportunity to challenge yourself, and develop your interests and passions: Media Future Week is for you! Watch the MFW16 aftermovie or see this impression to get a feeling what MFW looks like. Or read the MFW16 day reports to find out what MFW16 was all about.